Cambridge, MA - Did our Sun have a twin when it was born 4.5 billion years ago? Almost certainly yes -- though not an identical twin. And so did every other Sun-like star in the universe, according to a new analysis by a theoretical physicist from the University of California, Berkeley, and a radio astronomer from the Smithsonian Astrophysical Observatory at Harvard University. "We are saying, yes, there probably was a Nemesis, a long time ago," said co-author Steven Stahler, a UC Berkeley research astronomer. In this study, "wide" means that the two stars are separated by more than 500 astronomical units, or AU, where one astronomical unit is the average distance between the Sun and Earth (93 million miles). A wide binary companion to our Sun would have been 17 times farther from the Sun than its most distant planet today, Neptune. Based on this model, the Sun's sibling most likely escaped and mixed with all the other stars in our region of the Milky Way galaxy, never to be seen again. "The idea that many stars form with a companion has been suggested before, but the question is: how many?" said first author Sarah Sadavoy, a NASA Hubble fellow at the Smithsonian Astrophysical Observatory. "Based on our simple model, we say that nearly all stars form with a companion. The Perseus cloud is generally considered a typical low-mass star-forming region, but our model needs to be checked in other clouds." "The key here is that no one looked before in a systematic way at the relation of real young stars to the clouds that spawn them," Stahler said. "Our work is a step forward in understanding both how binaries form and also the role that binaries play in early stellar evolution. 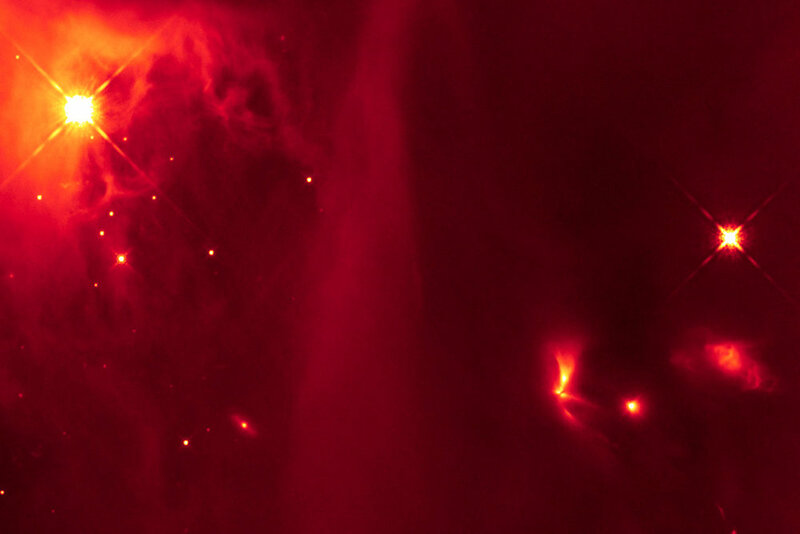 We now believe that most stars, which are quite similar to our own Sun, form as binaries. I think we have the strongest evidence to date for such an assertion." The Perseus molecular cloud is one such stellar nursery, about 600 light-years from Earth and about 50 light-years long. Last year, a team of astronomers completed a survey that used the Very Large Array, a collection of radio dishes in New Mexico, to look at star formation inside the cloud. Called VANDAM, it was the first complete survey of all young stars in a molecular cloud, that is, stars less than about 4 million years old, including both single and multiple stars down to separations of about 15 astronomical units. This captured all multiple stars with a separation of more than about the radius of Uranus’ orbit -- 19 AU -- in our solar system. Stahler heard about the survey after approaching Sadavoy, a member of the VANDAM team, and asking for her help in observing young stars inside dense cores. The VANDAM survey produced a census of all Class 0 stars -- those less than about 500,000 years old -- and Class I stars -- those between about 500,000 and 1 million years old. Both types of stars are so young that they are not yet burning hydrogen to produce energy. Using these data, Sadavoy and Stahler discovered that all of the widely separated binary systems -- those with stars separated by more than 500 AU -- were very young systems, containing two Class 0 stars. These systems also tended to be aligned with the long axis of the egg-shaped dense core. The slightly older Class I binary stars were closer together, many separated by about 200 AU, and showed no tendency to align along the egg’s axis. "This has not been seen before or tested, and is super interesting," Sadavoy said. "We don’t yet know quite what it means, but it isn't random and must say something about the way wide binaries form." "As the egg contracts, the densest part of the egg will be toward the middle, and that forms two concentrations of density along the middle axis," he said. "These centers of higher density at some point collapse in on themselves because of their self-gravity to form Class 0 stars." "Within our picture, single low-mass, Sun-like stars are not primordial," Stahler added. "They are the result of the breakup of binaries." Such studies may come along soon, because the capabilities of a now-upgraded VLA and the ALMA telescope in Chile, plus the SCUBA-2 survey in Hawaii, "are finally giving us the data and statistics we need. This is going to change our understanding of dense cores and the embedded stars within them," Sadavoy said.